CONTENTS: 1. A Preview of The Cell; 2. Techniques for Cell Study; 3. Cell Wall and Extracellular Matrix (ECM); 4. Cell Membrane (Including Plasma Membrane); 5. Cytoskeleton: Microtubules, Actin Filaments and Intermediate Filaments; 6. Eukaryotic Cell Organelles : 1. Mitochondria; 7. Eukaryotic Cell Organelles: 2. Mitochondria; 8. Eukaryotic Cell Organelles : 3. ER, Ribosomes, Endosomes, Golgi, Lysosomes, Peroxisomes, Hydrogenosomes and Centrosome; 9. Prokaryotic Organelles (Magnetosomes, Carboxysomes, etc. ); 10. Plasmids, IS Elements, Transposons and Retroelements; 11. Membrane Function: 1. Cell Adhesion and Cell Junctions (Including Plasmodesmata in Plant Cells); 12. Membrane Function: 2. Membrane Transport and Membrane Excitability (Neurotransmission); 13. Membrane Function: 3. Vesicular Transport and Membrane Fusion (Secretory and Endocytic Pathways); 14. Cell Metabolism:1. Enzymes, Bioenergetics and Metabolic Energy; 15. Cell Metabolism: 2. Aerobic and Anaerobic Respiration; 16. Cell Metabolism: 3. Photosynthesis and Photorespiration; 17. The Cell Nucleus: 1. Nucleus and Nuclear Pore Complex; 18. The Cell Nucleus: 2. Nucleolus and Other Subnuclear Organelles; 19. The Cell Nucleus: 3. The Chromosomes; 20. Cell Division in Eukaryotes : 1. Mitosis and Meiosis; 21. Cell Division in Eukaryotes: 2. Genetics and Molecular Basis of Cell Cycle; 22. Structure of Prokaryotic Nucleoid and Molecular Basis of the Division and Eukaryotic; Organelles; 23. Programmed Cell Death and Apoptosis; 24. Germ Cells, Fertilization, Parthenogenesis and Apomixis; 25. Basic Concepts in Genetics; 26. Maternal Effects and Cytoplasmic Inheritance; 27. Linkage and Crossing Over in Diploid Organisms (Higher Eukaryotes); 28. Tetrad Analysis, Mitotic Recombination and Gene Conversion in Haploid Organisms (Fungi and Single Celled Algae); 29. Sexuality and Recombination in Bacteria and Viruses; 30. Molecular Mechanism of Genetic Recombination: 1. Homologous Recombination; 31. Molecular Mechanism of Genetic Recombination: 2. Site-Specific Recombination; 32. Recombination and Resolution of Gene Structure (A Modified Concept of Allelomorphism); 33. Structural Changes in Chromosomes; 34. Numerical Changes in Chromosomes; 35. Mutations : 1. 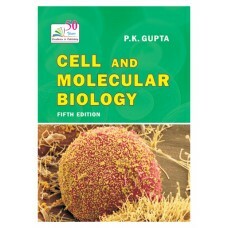 Biochemical Level (Biochemical and Microbial Genetics); 36. Mutations : 2. Molecular Level (Mechanism); 37. Chemistry of the Cell 1. Micromolecules (Sugars, Fatty Acids, Amino Acids, Nucleotides and Lipids); 38. Chemistry of the Cell 2. Macromolecules (Chemical Bonds, Nucleic, Acids Proteins & Polysaccharides); 39. Synthesis, Modification and Repair of Nucleic Acids; 40. Organization of Genetic Material: 1. Genome Size, C-Value Paradox and Repetitive DNA Sequences; 41. Organisation of Genetic Material 2. Packaging of DNA as Nucleosomes in Eukaryotes; 42. Organization of Genetic Material 3. Mitochondrial, Chloroplast and Apicoplast Genomics; 43. Organization of Genetic Material 4. Split Genes, Overlapping Genes, Pseudogenes, Retrogenes and Cryptic Genes;44. Multigene Families in Eukaryotes; 45. Dynamic RNA: Ribozymes, Small/Long ncRNAs and RNA World; 46. The Genetic Code; 47. Transcription in Prokaryotes and Eukaryotes; 48. RNA Processing (Decay, Splicing, Editing and Repair of RNA); 49. Molecular Machines for Translation of mRNA (Ribosome, tRNA and aaRS); 50. Translation of mRNA; 51. Protein Modification, Folding, Translocation and Degradation; 52. Operon Circuits in Bacteria and Other Prokaryotes; 53. Regulation Cascades in Bacteriophages; 54. Regulation of Gene Expression in Eukaryotes; 55. Chromatin Remodeling and Cellular Memory in Eukaryotes; 56. Cell Receptors and Signal Transduction; 57. Specification of Cell Fate and Cell Commitment; 58. Genes in Development;59. Epigenetics and Epigenomics; 60. Immune System in Animals and Plants; 61. Genetics of Cancer: Proto-oncogenes, Oncogenes Tumour Suppressor Genes; 62. Recombinant DNA, Molecular Probes, Gene Libraries, PCR and DNA Chips; 63. Molecular Markers, Restriction Maps and Molecular Genetic Maps; 64. Isolation, Sequencing and Synthesis of Genes/Genomes; 65. Gene Transfer and Gene Targeting; 66. Transgenic Animals and Plants; 67. Hybridoma and Monoclonal Antibodies; 68. Stem Cells and Therapeutic Cloning; 69. Genomics, Proteomics, Transcriptomics and Metabolomics 70. Bioinformatics, In Silico Biology and Systems Biology; References; Author Index; Index.